My cardboard sign for day two. In the end it went much more smoothly than I anticipated. I took off from Feldkirch, Austria on Saturday morning. My gear consisted of a backpack, a sports bag full of clothes and a cardboard sign with "Kiel" and a large smiley face on it. This is how it went down. The driver was a friendly looking older woman who had stopped right by the side of the highway access ramp to let me in. She was only going to Bludenz, which was about 20 km away right by the German border. At this point I was just excited to get a ride so I gladly accepted. It was beginning to seem as if this hitchhiking thing was actually going to work. The woman lived in Feldkirch and worked in the hospital there. She had family in Bludenz, and was now on the way there to help some relatives who were building a house. As there were no service stations on the highway close to the destination, I let her drop me off in the center of Bludenz. At the time I did not realize the gravity of my mistake. I had read online that hitchhiking out of the center of a city can be problematic. This was quite obviously the case. Not many cars seemed to be on their way out of the center, let alone going a significant distance in the direction of Sweden. Not knowing what else to do I decided simply to walk north. After about an hour’s walk I reached a stretch of road that was under construction in such a way that the sidewalk was unusable. In other words, I would need to get a ride in order to continue on my path. People I had spoken to on the way had told me I would most likely need to get to Lindau, just across the German border, in order to get back onto the highway. I took out my paper and flip-board marker and made a new sign for Lindau. It was only a few minutes before a guy about my age stopped to pick me up. He was not going to Lindau, but he told me he could drop me off at a truck station on the autobahn close to Lindau. This sounded perfect and so I happily agreed. He drove me for 5 or 10 minutes and we chatted the entire way. In the end he dropped me off at the aforementioned truck stop, which was on the autobahn right by the border to Germany. As he drove off I began asking the few truck drivers who were standing in groups swapping stories if they were traveling north. Now, I don’t speak much German, but I did understand enough to realize that all the drivers at this location had finished their routes for the day. It was Saturday and seemingly none of them were continuing through the weekend. I was stuck once again. My next step? Attempting to hitchhike from the side of the highway. A good idea? No. It only took about half an hour to realize that I was not going to get a ride this way. There was nowhere for cars to stop safely, even if they would have had time to read an react to my sign before they had driven by. Luckily I gave up before I managed to get run over or picked up by the police. At this time I was fighting an increasing feeling of doubt. I had been hitchhiking for close to 4 hours and had only managed to travel 50 kilometers. On top of that I had no clear plan as to where to go or what to try next. That’s when I spotted a narrow path leading into the forest by the side of the highway. I approached the path and saw that there were houses only a couple hundred meters away on the far side of the trees lining the highway. With no other plan in mind, I decided to walk over to the small collection of houses. As I walked along the small road leading up to the buildings, backpack and duffel bag around my shoulders and cardboard sign in my hand, a small van slowed and stopped next to me. The driver was a middle-aged man with a worn tank top and tattoos covering his arms and shoulders. Next to him was a slightly younger woman seemingly with an equal affinity for body art. The man asked me if I was looking for a place to get onto the highway. He explained that he had seen my sign and assumed I was lost. I told him I was looking for a highway access ramp to hitchhike from, and asked him if he knew where I should go. The man did in fact know a good place, but explained it would take around half an hour to get there. He began describing the route for me, but a minute or so in he seemed to realize that the explanation was getting to long and complicated. He offered to drive me there himself. As soon as the man offered me a ride my mind did a split second assessment as to how trustworthy the couple seemed. There was no way to be sure of course, but they seemed genuinely nice. It only took me a second to thank the man and accept his offer, and so I got in the back seat of the van and we took off. Five minutes later the couple dropped me off at a service station next to a highway access ramp. It seemed I had finally found a good place to hitch a ride. I gave a wave to the couple as they drove off and proceeded to strategize in my mind as to my next move. My two options were to hitchhike from the side of the access ramp with my sign and my thumb, or to approach customers at the service station and ask for a ride face-to-face. I decided to get lunch. After grabbing a burger at the McDonald’s across the street (wherever you are, aways a safe bet), I walked over to the service station and began approaching people as they stopped for gas. I was quickly surprised by how nice everyone was. Even though they routinely said no — They were either going the wrong direction or their cars were full; that figures! — people did not shun me as I was prepared they might. Most of them simply listened to me ask for a ride north, politely declined (with some reason or excuse) and wished me luck. Every now and again someone would simply fail to acknowledge my existence when I approached, but they were few and far between. Despite people’s unexpected positive attitude towards me, I was not able to get a ride in the hour and a half or so that I walked around speaking with people at this service station. My watch was showing half past two when I decided to change my tactics. I got my stuff and walked over to the side of the access ramp. It was time to try the more classic hitchhiking approach. Once again I held up my sign and stuck out my thumb. I soon noticed that drivers seemed to enjoy the “Kiel” side of my cardboard sign (750 km) more than the “Frankfurt” side (300km). They didn’t stop for either, but seeing some crazy kid trying to hitchhike right across Germany seemed to give people a good laugh, and that kept me smiling as well. That was a good thing, because it took another hour before a car finally slowed down and pulled up next to me. It was a an old station wagon—not exactly run-down, but it had seen better years. In it was a southern-european looking man. He pulled down the passenger-side window and asked me in german if I needed a ride. I replied in english, asking where he was going. He explained to me in broken half-english, half-german that he was going to Hannover—roughly 700 km in the direction of Kiel. I was stunned. I couldn’t believe my luck. I got in the car. The man spoke very little english and my german is extremely limited, but we did find a way to communicate. As it turns out, the man was from Sicily but had lived in Hannover for 25 years. He worked at a car-repair shop with many of his colleagues being Spanish, and so he had picked up Spanish over the years. Now, I speak some Spanish, and whatever I don’t know I can make up for with my Portuguese. This way we were able to have a conversation. I learned that the man had been to Sicily to visit his friends and family over the summer, and was now on his way back. His wife had also been down but had flown up a week earlier for work. Turns out he was a nice, social guy who was just happy to have someone to talk to during the last few hours of his drive home. When we finally reached Hannover, it was around 8 pm and the sun was low in the sky. My kind driver dropped me off at the edge of the city, wished me luck with my continued travels, and drove off. It was now time to find a hostel. I picked a direction and began walking. After only a couple hundred meters I came to a small café, which as it happens had a Portuguese theme. I walked in and asked the lady behind the counter if she knew where I could find a hostel... in Portuguese. She was surprised to say the least—I don’t exactly look like I speak the language. After that she was more than willing to help. She called me a taxi and I used that to get to the nearest hostel. There was a concert going on in the area that evening, which meant that all beds in the hostel were taken except for one. More luck it would seem. I went in, left my stuff, went in to town for a kebab, came back, and went to bed. It didn’t take many seconds to get to sleep. I began the second day of my trip with a tram ride out to the edge of Hannover. The hostel receptionist had given me a couple of tips as to where I could start my hitchhiking for the day, and I was trying to make it out to a gas station by one of the highways running through the outskirts of the city. The tram ride itself was uneventful except for a coordinated team of undercover ticket inspectors surrounding me with smug grins on their faces. They had undoubtedly seen my hitchhiker’s cardboard sign and figured I wasn’t the type to buy a tram ticket. When I pulled out my walled and produced the shiny piece of card—along with a grin of my own—they were shocked. Once I reached the last stop, there was some walking to do before I got to the gas station. Around 20 minutes and one jumped fence later, I was at the station and speaking with drivers. The flow of cars was sparse though, and everyone I spoke to was heading into the city rather than passing through it. After about an hour and a half it became apparent that I would need to try another spot. The clerk in the station shop helped me figure out where I needed to go—a service station by the side of the autobahn just 10 minutes away by car. The problem was that the only good way of getting there was by driving. In the end the clerk had to call me a cab. When I explained to the taxi driver where I wanted to go, he just stared at me. Then he burst out laughing. Turns out not too many fares ask to be driven from one service station to another for the sake of hitching a ride to the next country. Well at the service station, my spirits were lifted considerably. There was a heavy stream of cars passing through the very large fueling area, with more cars parked by a roadside restaurant perhaps fifty meters away. Furthermore, looking at the registration plates I could see that around a third of the cars were Danish, and around one in ten were Swedish. People driving home after vacationing in the southern parts of Europe no doubt. Now all I had to do was bag me a ride. Despite the very promising outlook, it took some time before I found the right car. I began by speaking to the drivers who were stopping for fuel. There were around 8 or 9 pumps, so I would talk to the drivers, wait five minutes to allow a new batch of cars to come in, talk to the new drivers, and so on. After about an hour of “no’s” I decided to try another tactic and walked over to the parking lot next to the nearby restaurant. Unfortunately my collection of “no’s” simply continued to grow. As a side note, I should mention that the drivers were unexpectedly friendly here as well. Most of them simply explained that their cars were either full of people or full of packing. A quick look through the windows showed that they were in fact telling the truth. There were of course also many who were not going very far in the right direction. Seeing the number of Swedish and Danish cars at the gas station, I had decided that I would probably be able to hitch a ride to Denmark, if not all the way to Sweden. At the far end of the parking lot, an access road led back onto the autobahn. As I approached I saw that two guys—slightly younger than me—were standing there trying to hitchhike as well. Speaking with them, it turned out that they were just trying to get to the next big city, a couple of hundred km away, and that this was also the first time they took a shot at hitchhiking. I told them I was hitchhiking to Sweden, and that I had been walking around speaking with drivers. Seemingly they had not thought of this option, and asked me if it was better than standing by the side of the road with your sign and thumb. Not wanting the competition, I told them it was probably about the same, and that I would let them keep their spot to themselves as they had gotten there first. I walked back to speak with more drivers, and they kept trying to stop cars by the access road. Suckers. I got the impression that he wasn’t as interested in my particular answers as in the way I gave them. At that point I didn’t yet know that he was a defense lawyer, and that he was no doubt assessing my honesty and trustworthiness. When he was done asking questions he paused for a moment, with a scrutinizing look on his face. Then he suddenly relaxed and smiled. He asked the girl if she thought they should give me a ride. She shrugged—“Why not”. As we drove out from the service station, I could see the two guys I’d spoken to earlier were still in the same spot. Their tactics had evolved to taping their sign to the end of a long stick, which they waved in front of passing cars. Probably not the best way to get people’s trust. As it turns out, the man and girl were father and daughter, driving home from a vacation in their summer house in Italy. They ended up giving me a ride all the way to Sweden—a trip of around seven hours, including a ferry ride from Germany to Denmark. We spent most of the time talking, and I couldn’t have asked for better “hosts”. They took me as far as Landskrona, where I asked them to drop me off at a service station. At that point it was around 8pm and I was still two and a half hours from Gothenburg. I decided to try to get there before nightfall. I had read that hitchhiking at night was a bad idea, but I figured that "night" was still a few hours away. 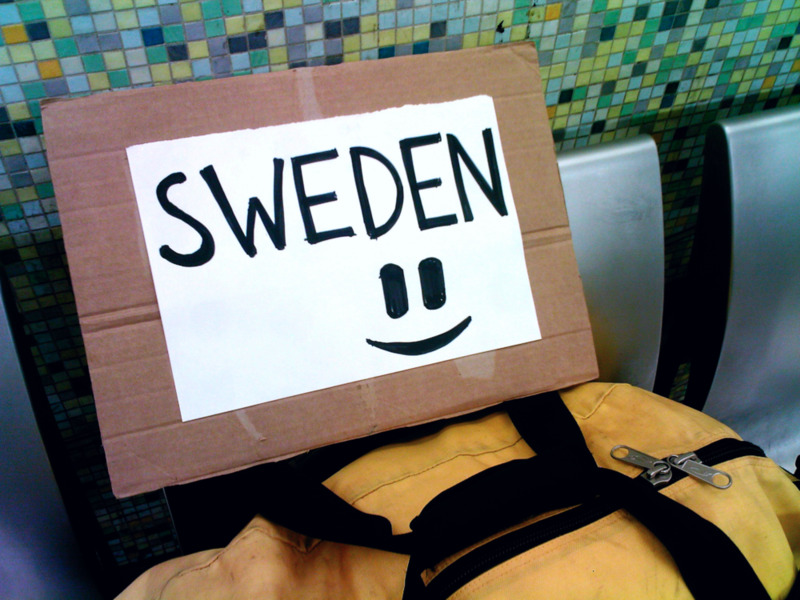 I bought a coffee and a sandwich in the service station's shop, and sat down to make a new sign—the one with "Sweden" on it would mostly confuse people at this point. Once I started asking around at the pumps it only took around 15 minutes before I found a ride. Most Swedes would have nothing to do with me—I guess we're a cold nation in more ways than one—but I found an extremely friendly Lithuanian man who agreed to take a slight detour through Gothenburg in order to drop me off. It turned out he was a medical doctor based in Denmark, now driving up to a town just north of Gothenburg in order to help out at an understaffed hospital. His sister was with him, but neither her English nor her Swedish were very good so she didn't say much. The man spoke the entire time however, which was nice as all I had to do was listen and give the occasional sign of agreement. He was speaking Danish with a Lithuanian accent so I understood almost nothing, but that was OK by me—I was pretty exhausted after the day. He dropped me off at a bus station at the edge of Gothenburg. I thanked him and gave him a wave as he drove off. All that was left was a 10 minute bus ride to my apartment, which I hadn't seen in a year. Hitchhiking from Austria to Sweden in two days. I had made it. I’d like to thank the community over at Hitchwiki, who I got most of my information from. If you ever decide to give hitchhiking a try, they’re an amazing resource.